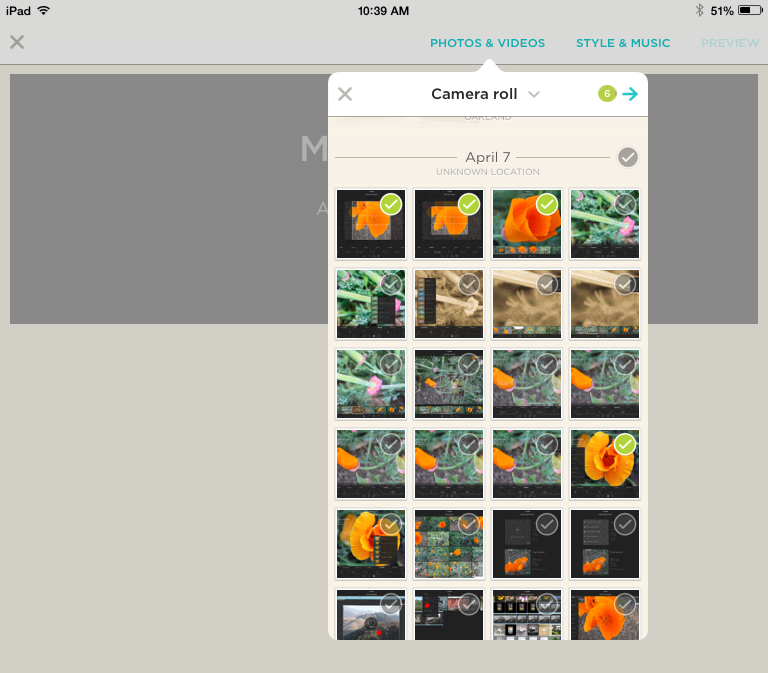 You may already know Animoto Video Maker as a shooting and sharing app for smartphones of the iOS and Android persuasions, but today the company has released a new version of its app for the iPad. The launch of Animoto Video Maker for iPad coincides with the the app’s 10 million user mark. Animoto, which hosts your video creations in the cloud, is targeted to a wide population of consumers, small businesses, educators, and photographers, and offers various pricing plans. The app is very easy to use, with guided, step-by step features. Within a minute or two, you can create a pro-quality video based on new shots or videos stored in your camera roll. Just launch the app to access your camera roll, tap the Create Video button at the top of the screen, or start shooting photos or video from your iPad. The app assembles all your photos and videos in one place. You can also add a title and subhead to the composition. 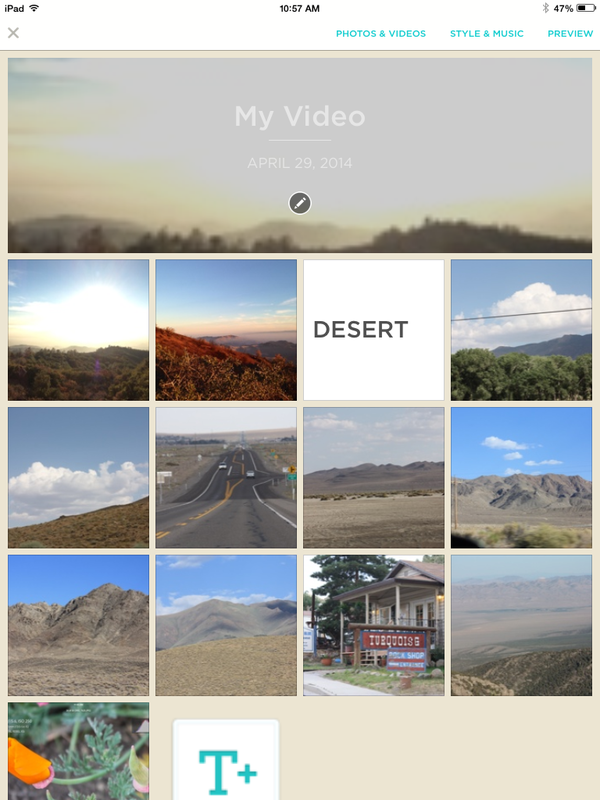 Animoto’s palette displays all of your assets, and each image or video you choose marks a checkbox green. To see your selected picture better, tap on it for a larger preview. When you’re done picking your elements, it’s time to add a style and music to the composition. 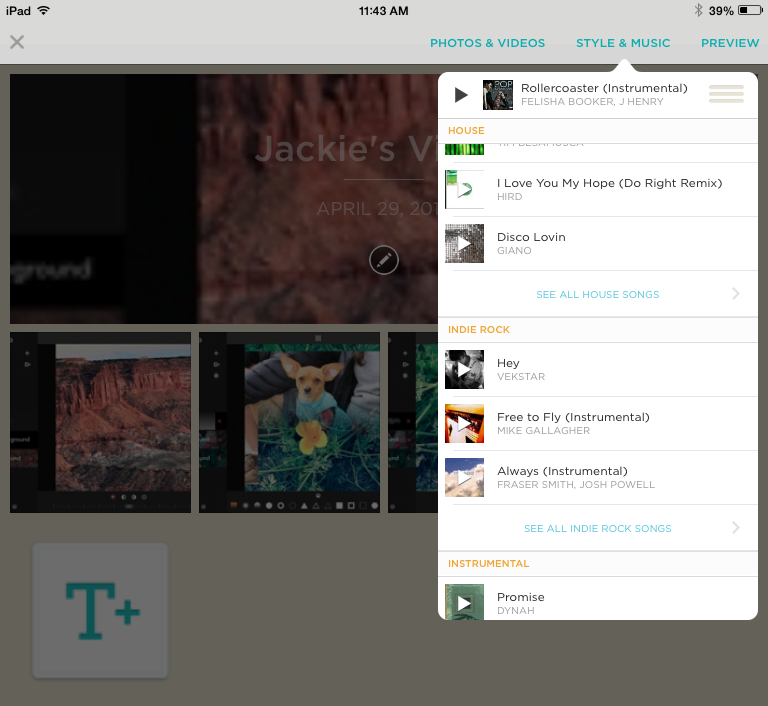 For that, Animoto packs a choice of more than 50 themes and original music to fit the content and mood of your video. Choose from themes like Autumn, Birthday Gifts, Color Frame, Dance Party, Earth, Life’s a Beach, and more. After previewing the themes you like, tap to choose the one you want to use. The app’s themes are paired with a variety of royalty-free musical selections, including children’s songs, classical, country, electronica, hip hop, and more. Choose the photos and videos you want to use from the camera roll. When you’re done gathering the raw materials for your video, tap the Preview button to see the movie. You may not like your first effort, but that’s no problem. You can always go back and edit the video—swap out images and video or change themes or the headline—until you’re satisfied. When you’re done, you can share the finished video to Facebook, Twitter, or YouTube or email it to yourself. You can also link to or embed your video in your blog or website. A selection of royalty-free music is available for your movie. Animoto offers a variety of personal and business subscriptions that allow unlimited video creation and sharing, but which restrict the length and quality of your movie and the number of themes and songs available. For personal accounts, there’s a free version, as well as monthly subscriptions of $30 or $249 per year. Business plans range from $249 to $499 per year. Animoto’s cloud hosting service lets you play back movies you create on your smart devices, computer, or TV. The app also supports Apple’s iCloud Photo Stream. The app now works on both the iPhone and iPad running iOS 7.